Description: G439 Granite is a medium to coarse-grained, light grey trondhjemite of the Precambrian period. This stone internationally may be nominated as a granite but in the area of application of the European Standard this stone must be nominated as a Tonalite. During the polishing process a clear epoxy resin filler may be used to fill any micro fissures or tiny pitting however this does not affect the integrity of the stone, it merely provides an even smoother surface finish. G439 Granite is suitable for both interior and exterior use futhermore is frost resistant and with a constant polish. 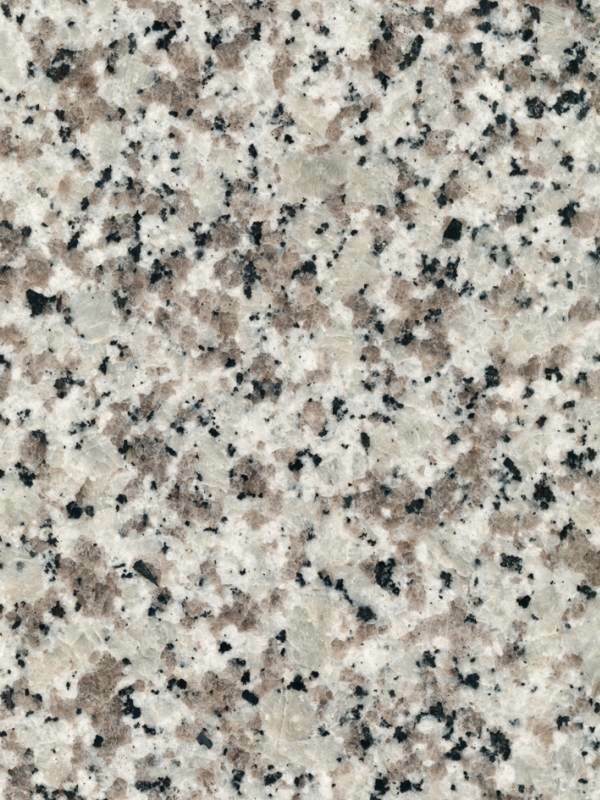 Surface Finish: G439 Granite looks best with a gloss polished surface but is also available as honed, leather/satin, river-washed/antique, thermal/flamed, brushed and sandblast finish. Sealing: Test with a small sample. It is possible that a sealant can be used on G439 granite however excessive attempts at sealing it could actually create a residue film build-up. Quarry Location: G439 Granite is quarried near Puning, Guangdong province, China. Synonyms: Beata White, Big White Flower Granite, Blanco Delta, Delta White, G4439, Jasmine White, Puning Da Bai Hua, Royal White, White Flower, White Lotus, White Pearl. Trondhjemite: A light-coloured tonalite (leucotonalite) in which plagioclase is dominated by oligoclase. Trondhjemite is most common as part of Archean trondhjemite-tonalite-granodiorite (TTG) suite of intrusions and are usually high-grade metamorphic rocks. It is distinguished by a relatively high SiO2 content (expressed in the rock as abundant quartz) and a high Na/Ca ratio. Tonalite: An igneous, plutonic (intrusive) rock, of felsic composition, with phaneritic texture. Feldspar is present as plagioclase (typically oligoclase or andesine) with 10% or less alkali feldspar. Quartz is present as more than 20% of the rock. Amphiboles and pyroxenes are common accessory minerals. In older references tonalite is sometimes used as a synonym for quartz diorite. However the current IUGS classification defines tonalite as having greater than 20% quartz, while quartz diorite varies its quartz content from 5 to 20%.